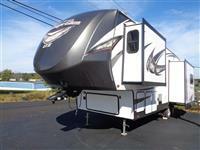 Wildwood Heritage Glen Ltz Fifth Wheels - Berks Mont Camping Center, Inc. Introducing Wildwood Heritage Glen LTZ by Forest River! Berks Mont Camping Center offers a complete line of Wildwood Heritage Glen LTZ travel trailers including the versitile fifth wheels line. With nine fifth wheel floor plans ranging from 34' to 40', the Heritage Glen offers sophisticated luxury while providing an affordable travel trailer for families of all sizes. Additionally, the Heritage Glen Hyper-Lyte family of fifth wheels offers for the FIRST time, three fifth wheel floor plans! Click here for a complete list of Heritage Glen fifth wheel floor plans and 360 views. Click here for a complete list of Heritage Glen Hyper-lyte floor plans and 360 views.